My home has a fireplace and before the oppressive smoke of wildfires ruined the joy of lighting it, I used to start a fire once in a while during the colder months. Firewood isn't readily available here in the Bay Area, so I would often have to resort to the use of firelogs since they were easily obtained in the barbeque section of my local grocery store. This lead to a conversation with a friend of mine who assured me, "There's no shame in the chemical flame." 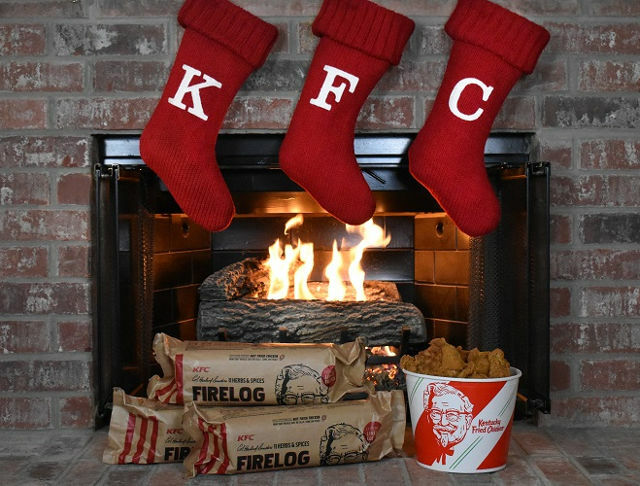 Well, KFC's latest promotional item, the 11 Herbs & Spices Firelog from Enviro-Log®, puts the shame back into the chemical flame. Yup, it's a chemically-engineered firelog that emits the scent of their fried chicken. This fried chicken firelog was available for $18.99 but has since sold out.